Just your typical bumper to bumper traffic crawling along at a snail’s pace. Nothing to see here. Ulaanbaatar is the capital and largest city in Mongolia. To fully get an idea of what it’s like to drive (and park) there you need to understand a few things about the city’s history. Mongolia used to be a Soviet satellite and most of the city was designed and built in the Soviet style during this time. People couldn’t freely move where ever they wanted so the city was designed for a static population of 600,000. The idea that the city would grow and that they would need to plan for this growth wasn’t really considered. Also the idea that every single person who lived in the city would own a car was perfectly ridiculous. So the city streets are narrow and small and parking is extremely limited. Mongolia gained its freedom with the collapse of the Soviet Union and with that freedom came an influx of people to the capital. The current population is officially 1.3 million but more realistic estimates put it closer to 1.7 million people. That’s half the population of the country. In a city designed for much less. Traffic is crazy, to say the least. It can take 30 minutes to travel 3 miles. Congestion is just normal over there. And parking? Like I said, there is parking, just not much. So what do you do if you can’t find a parking space? You double park. What I mean is, if two cars are already parked in a parking space you park in front of them. You block them in. This is the same scene in every parking lot throughout the city. 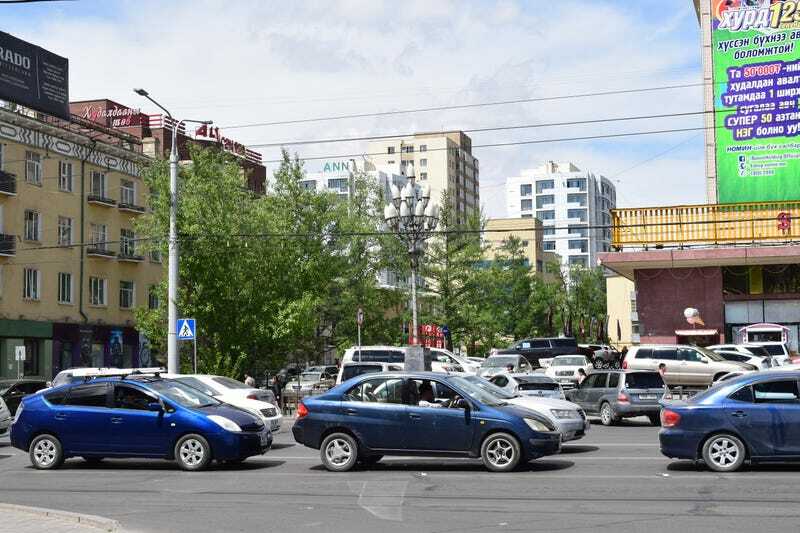 Now before you get all upset and start talking about how you would key up any car that blocked you in, let me explain how this works in Mongolian car culture. Every single car owner puts their phone number in the lower corner of their windshield. Everyone does it. Everyone does it because everyone double parks at some point. It’s just something Mongolians do. Lots of businesses give out these number cards in the same way businesses in the U.S. give out calendars and refrigerator magnets. Some people get really fancy with their phone numbers. I think this type has battery powered LEDs that light up at night. So what do you do if you come back to your car and see that you are blocked in? You look on the windshield, call the number, and say “Hey, move your car.” The people who double park are always nearby. You only have to wait a few minutes and because you yourself have to double park from time to time there is no anger or road rage toward the person who blocks you in. This is a perfect example. She called the number on the Impreza and the driver was there a few minutes later to move his car. What&apos;s wrong with performance SUVs?